The Ferrari F40. The last car commissioned by Enzo himself, and the first of many legendary Ferrari super cars. I was fortunate enough to see three this past week while on vacation in Monterey; one in a driveway, one on the road, and one at an auction. The F40 that was auctioned by Gooding & Co. was once owned by Paul Allen sold for $1.32 million after fees. Does that mean I have a $73,000 model on my hands? 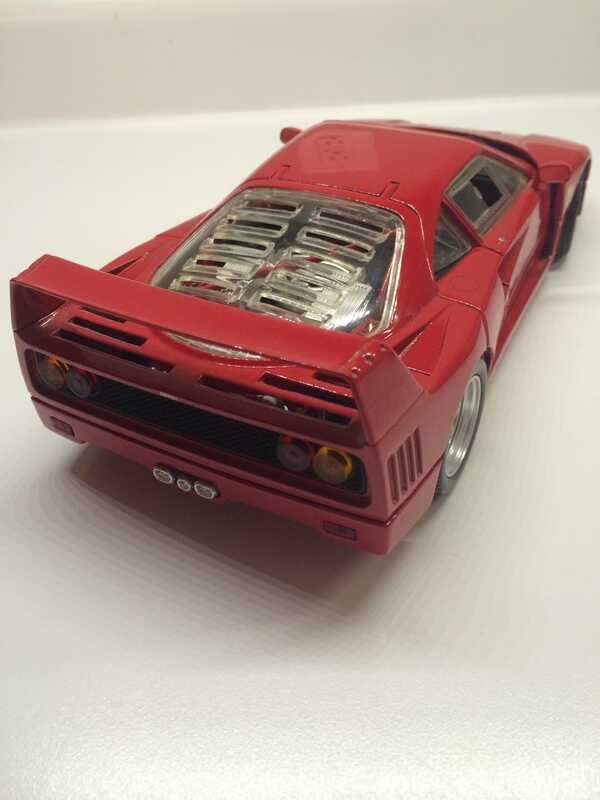 This is a review of the 1/18 scale Ferrari F40 manufactured by Hot Wheels. There are a few details missing from this model that would just make it so much better. Most Ferrari F40's have a black stripe around the middle of the entire car, that stripe was left off this model. Also, some F40's have a small stripe of rubber on the front and rear bumpers, which this model also does not have. Small details like the belt not really securing the spare tire, missing reverse lights, and the lack of hood locks really let this model down. It could have been better. All in all, this model is put together pretty well. The doors snap shut and stay open if you want them to. The piece meant to hold the heavy hood open is really light and flimsy. One can visibly see the bar start to bend over time and I would not feel comfortable displaying this model with the engine cover open full time. I'm also unsure about the side mirrors, which can fold about 270 degrees forward and back. Part of me gives Hot Wheels the benefit of the doubt that these mirrors were designed this way so that they would not just snap off. The other half can't tell if these are just cheaply made. The doors open, the engine compartment opens, and the front clamshell opens. The F40 wasn't really a car with many features to begin with, so I guess that makes this model pretty accurate. Not too rare, not too common. Most of the models on eBay are Kyosho, which are more pricey. Bburago also made an F40 in at similar price point. A must if you admired this car growing up as much as I did. I'd pass on it for my everyday collection though. If I hadn't been just a kid when I got this, I probably would have saved up to get the Kyosho model. A bunch of 5's across the board may seem like a lazy review, but it's really just an average model. The fact that it is an F40 is the only thing special about it.